Electrical problems are common concerns in any household. Therefore, every homeowner must always hire an electrician who can take care of any issue that is making life inconvenient and uncomfortable, right from the ceiling fans, exhaust fans, security and home automation systems, fuse and breakers, and so on. We, at JPEG Electrical Contracting, is a family owned and operated a company which can install, tests, connect, or maintains all kinds of electrical systems for any purpose including light, power, and air-conditioning. We cater to residential, commercial, and industrial clients. We have been in this industry for more than 15 years. With a cutting-edge technological support and highly knowledgeable professionals, we have gained a solid reputation amongst our clients in areas like Davie FL, Fort Lauderdale, Hollywood FL, Miramar FL, Pembroke Pines FL, and Plantation FL. So, if you need a reliable and expert solution for your electrical repairs, you can resort to us now. Here we have put together a few tips on how to choose the right electrical repair service. Take a look. 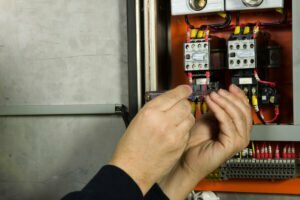 Before choosing a company, you must check if they have the proficiency and expertise to carry out the process of electrical repairs. Make sure they have the right technical resources and knowledgeable and experienced professionals who can tackle all your electrical needs. Electrical failures and other such emergencies can occur without any warning. In such a scenario, you must seek immediate help from the professionals. So, you must hire a company who is available 24×7. You certainly cannot afford to spend an unjustified amount for electrical problems. Hence, the cheaper the rates of the electrical service, the wiser a choice it will be. So, without any further delay, you should look for these things and choose an electrician of your choice. And if you want to opt for us, then quickly call us at 954-410-3995 now.